Jon Pohlkamp (left) and his father Terry Pohlkamp. Terry qualified for the Boston Marathon in 2001 but said he would not run it until he and Jon could do it together. 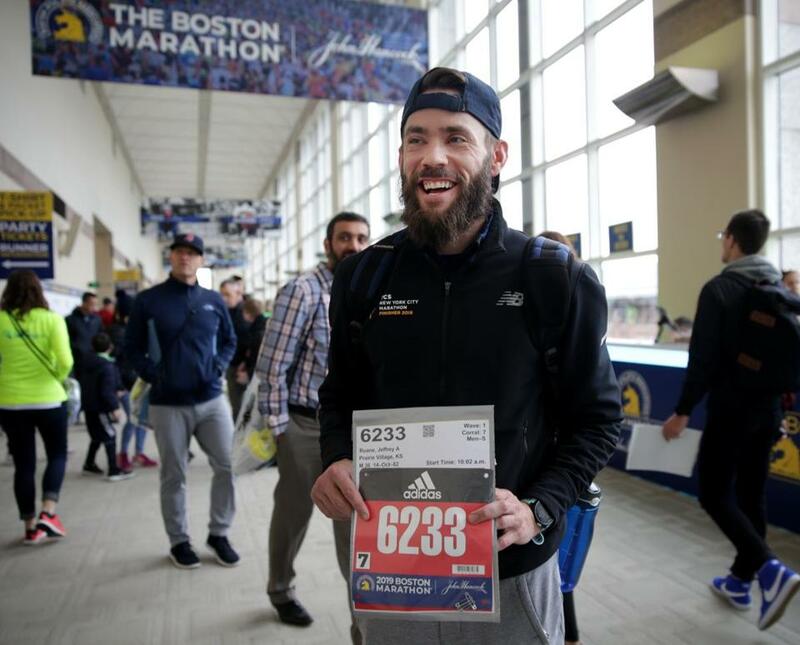 On Friday, Terry Pohlkamp and his son, Jon, walked down a long corridor in the Hynes Convention Center wearing matching Boston Marathon jackets, just steps away from completing a journey that had taken nearly 20 years. Way back in 2001, Terry Pohlkamp, who is from Scandia, Minn., ran his first marathon and did it in a time that was fast enough to qualify for the Boston Marathon. It is a feat that many spend a lifetime trying to achieve, as evidenced by what came next: He told his son, Jon, who was just a teenager at the time, that he would not run Boston until they could do it together. Terry Pohlkamp, who is now 67, continued to qualify year after year, but Jon Pohlkamp progressed slowly. On his 12th try, he pushed so hard he had to sit down at mile 15. But then he finally did it. On his 13th attempt, he qualified for Boston. “It was a special journey,” Terry Pohlkamp said as he watched his now 36-year-old son pick up his Marathon bib. It usually is, which is why for three days each April at the Boston Marathon Expo, the corridor in the Hynes center where the athletes pick up their race numbers becomes perhaps the most joyous space in Boston, filled with hugs and tears and photos, awash in the feeling of accomplishment. Running a marathon fast enough to be a Boston qualifier — known in the running world by the letters BQ — is for many an arduous journey, in which seconds matter and disappointment is just around the corner. Jeffrey Ruane is a first-time Boston Marathon qualifier. Each year, the Boston Athletic Association publishes its qualifying standards, the minimum time an athlete must run, based on their age and gender, to qualify for a coveted entry into the world’s most prestigious footrace. But even when that is achieved, the stress is not over, for no one knows for sure they’re in until the BAA makes its final cut. More people meet the qualifying standards than can fit into the race, so available spots go to the fastest runners. This year, the BAA announced that runners had to clock in 4 minutes and 52 seconds below the qualifying standards to gain entry. More than 7,000 qualifying runners were turned away. 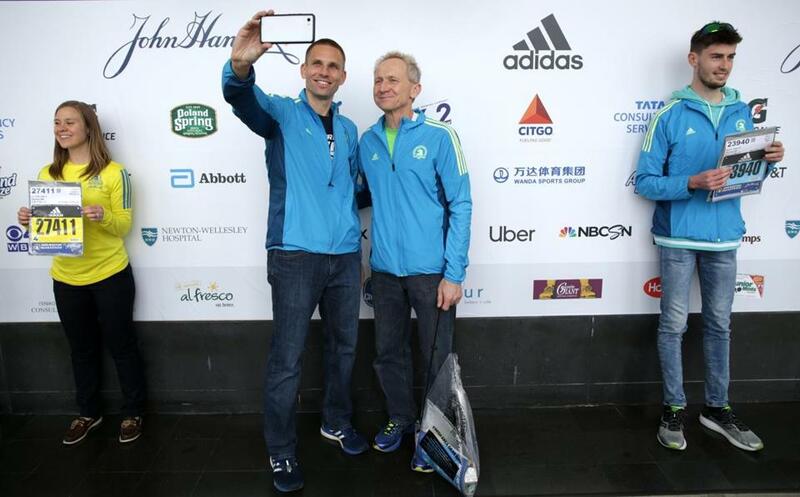 Which is why on Friday, as the three-day Boston Marathon Expo opened, athletes were streaming in the doors as soon as they cracked to get their hands on their bibs and make it official: They were running Boston. Patrick Quateman, a 36-year-old from Chicago, was one of the early ones in the bib room. He took seven marathons to qualify, and in that seventh marathon, when he saw his wife with 1 mile to go and knew he was going to be well below the qualifying standard, he could not contain his excitement. Matt Chatwell, 42, of Illinois was trailed by his wife and five children as he entered the bib room Friday, ending his own journey through seven marathons to a BQ, and the nerve-wracking wait to see if his time would be good enough. So does Christopher Lovera, a 53-year-old from Monterey, Calif., who pushed it so hard in his sixth marathon that he collapsed just after the finish line. After giving it his all for 26.2 miles, he missed his BQ by 27 seconds. But he nailed it in his seventh marathon, and when he got off the T at Copley Square on Friday and saw the finish line he hopes to cross Monday, it all hit him.